blog.HalloweenAdventure.com | Latest News from the Costumes Trend FrontLines! : Thanksgiving Decorations! One of the great things about Halloween is that once it’s over, it’s officially holiday season. You can start breaking out the Christmas music. It means Thanksgiving is just around the corner. To help you get into the spirit, we have some fabulous Thanksgiving oriented decorations to spice up your house in style. 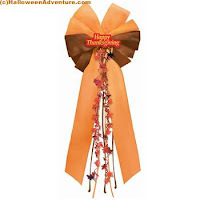 Our Happy Thanksgiving Bow with Tinsel is a fabulous addition to your home décor set. It looks great on the fridge, the front door, even on the wall! The bow is orange and brown. Orange, brown and black ribbons and a reddish-orange leaf shaped tinsel hang from the center. It reads "Happy Thanksgiving" and measures approximately 9.5" wide x 23.5" high. We’ve even put it on the mailbox! Kids with a thing for sparkles will love our Jumbo Glitter Turkey Cutout. 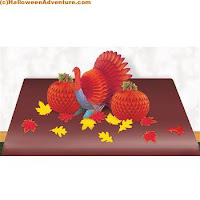 his shiny and colorful cutout measures approximately 23.25" wide x 14" high and features a glittery turkey in a pilgrim's outfit on one side. The cutout says "Happy Thanksgiving" in red glitter. We’d put this one on the fridge or let it shine on its own on the wall. 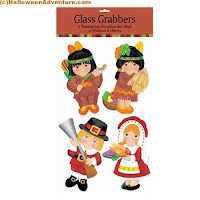 Decorate your windows with our fabulous Thanksgiving Glass Grabbers. These are great because they don’t just provide joy when your family sees them they alert the neighbors that you’re ready for Turkey Day! Package includes two Pilgrim grabbers and two Indian grabbers. Our grabbers are best on windows, but cling to many smooth surfaces. Best of all, they’re reusable year after year! Get in the spirit as the hostess with the mostest with our Thanksgiving Table Decorating Set. This fabulous honeycomb papered set comes with Pumpkin honeycombs centered around a honeycomb turkey and includes fabric fall leaves that add just a dash of spice to your centerpiece. 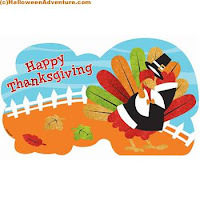 For more fun and fabulous Thanksgiving ideas, keep checking the Halloween Adventure blog. We always have more up our sleeve!